I've got nothing against silly marriage proposals—as long as they suit the personalities of the individuals getting engaged—but I still can't help but chuckle over how a 9to5Mac reader proposed to his Apple-loving sweetheart. You see, 9to5Mac reader Jordan apparently stayed up late and ordered an iPad 2 with the big question—"Will you marry me? "—engraved on the back of the device. Once the gadget arrived, he took his now-fiancée to National Redwood Forrest in Northern CA, found the largest tree in the world, and knelt down to present the shiny new toy. 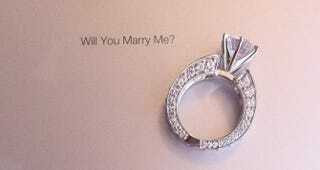 The whole thing ended quite happily as Jessica, his now-fiancée, quickly shouted "YES, now give me my iPad!" a few moments later.